A year ago, a corroded pipe operated by Plains All-American burst along the Gaviota Coast, a pristine coastline west of Santa Barbara. It released a river of crude oil into a creek that empties into the ocean at Refugio State Beach. 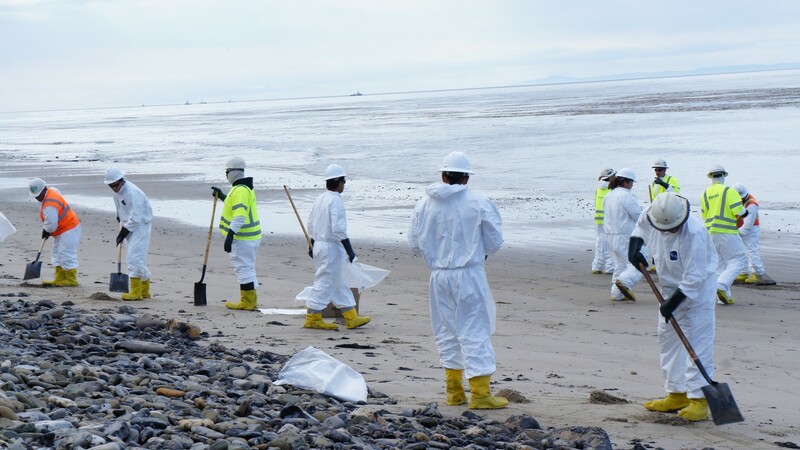 The beach may be cleaned up, but the story of the Refugio oil spill is not over. Valentine is Professor of Earth Science and Biology at UCSB, where he has served on the faculty since 2001. Valentine’s research interests focus on the interface of chemistry, microbiology and the oceans, on which he has published over 85 papers, three books and one patent. He worked extensively on the Deepwater Horizon disaster, serving on scene as a scientific responder, and then to assess damages to natural resources in the deep ocean. He also responded to the Refugio spill, both conducting independent research and as an adviser to the responding agencies. Valentine has participated in over thirty oceanographic expeditions, including more than 25 dives in the submarine Alvin, is a fellow of the Aldo Leopold program, and recently participated in a panel of the National Academy of Sciences reporting on the environmental effect of pipeline spills of diluted bitumen. Krop has worked at the EDC as a staff attorney since 1989 and as Chief Counsel since 1999. Her specialties include fighting offshore oil and gas development, protecting natural resources, and preserving open space lands. Krop’s successes include the unprecedented termination of 40 federal oil and gas leases offshore California, defeat of several specific oil drilling projects, and preservation of important areas for public access and ecological protection, including Hearst Ranch, Ellwood, Carpinteria Bluffs and Sedgwick Ranch. She represented the conservation community on the Channel Islands National Marine Sanctuary Advisory Council from 1998-2013, and teaches Environmental Law at UCSB. As a business, government, and political leader, Armendariz has engaged in local public policy advocacy on topics including domestic oil and gas development, county fiscal issues and land use policy. He’s testified many times before the County Board of Supervisors, the State Lands Commission, the California Coastal Commission, the California Legislature, and the Federal Department of Interior’s Minerals Management Service. Last year, his association funded a report on the economic impacts of the Plains All American Pipeline Shutdown. What questions do you still have? Ask them here or on the form below, and we will try and answer on June 14.